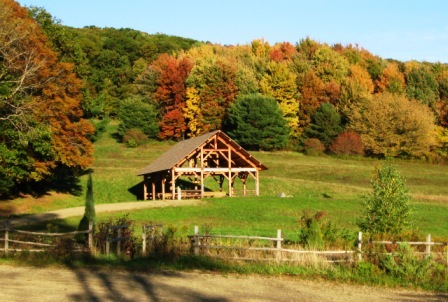 Sitting high atop Lillibridge Road, offering breathtaking views, enjoy our unique timber-framed pavilion which is available for rent for small gatherings, reunions, weddings, office parties, or receptions. The pavilion has five sturdy 8-foot picnic tables and an additional six 8-foot benches, easily seating 40 – 70 people. It is equipped with exterior and interior lights, electrical outlets, an elevated BBQ, a well with potable water, and shades on the weather-sides of the building. Due to the size of the pavilion and parking constraints, there is a maximum party size of 100 people. Please note that there are no regular bathroom facilities at the property, but a port-a-john is available from mid-April to mid-October. For more information or to book a rental of our pavilion, please contact us. Pfeiffer Nature Center is a wonderful place to host your child’s birthday party. In the great outdoors, at a spectacular location, the Nature Center will provide party space in the picnic pavilion, a place to hide presents, and a custom interactive nature program for participants. Popular with the younger set is the Happy Hummingbird Holiday! Imagine the giggles as children closely observe busy hummingbirds feeding in the bright red glass globes lining the picnic pavilion; inquisitive children wandering the meadow identifying wildflowers that attract hummingbirds and butterflies; crafty children constructing their own humming bird feeders to take home! These activities along with nature games and facepainting make for a fun filled outdoor adventure. The Nature Center staff is happy to coordinate programs with the child’s interest or party theme. For more information about birthday parties at Pfeiffer Nature Center please contact us. Pfeiffer Nature Center provides custom educational experiences for groups of all ages and interests. Whether it is a guided tour of our historic chestnut cabin, or a nature walk through the woods on the topic of your choosing, we are happy to discuss your ideas and how to create an interactive program tailored to fit your needs. For more information on custom programming please contact us.